Myanmar’s Kachin state has been rocked by huge protests this week against the US $ 3.6 billon Myitsone dam project to be entirely financed by China. The biggest protest rally took place in Manaw Park in the state capital town of Myitkyina of Kachin state on Thursday after more than 10,000 people from different parts of the state marched into Myitkyina. The protesters, mostly from Myitkyiba and Waingmaw townships, were led by Kachin political and civil society groups, religious leaders from the powerful Baptist Church and the Buddhist Sangha and the local youth groups. 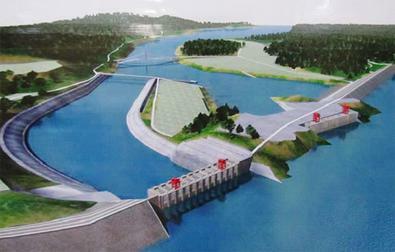 They called for a complete halt to the China-financed work on the Myitsone dam on the Ayeyarwady (Irrawaddy) River. The protests have been provoked by reports of fresh Chinese attempts to pressurize the Aung San Suu Kyi led NLD government to resume the 6000 MW hydel project. The project was discontinued by the previous Myanmar government led by President (and former general) Thein Zein in a bid to quell anger in Kachin state and among Burmese political parties who are apprehensive that the high dam for the project will not only submerge a huge fertile tract and cause displacement but also impact adversely on Myanmar’s agrarian economy. Irrawaddy is the country ‘s main river. “That dam is not for us. We support the free flow of the Ayeyarwady. We can’t accept implementing the project without the people’s will,” said U Sar Chi, one of the protest leaders. The protesters said that 90 per cent of the electricity that will be produced by the dam will be exported to China and will not benefit the country. They said the demonstration was also meant to criticize a recent statement by the Chinese embassy in Myanmar that most Kachin people support the project and only a few non-governmental organizations and political parties oppose it.